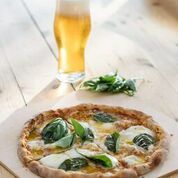 Home » Lifestyle » VADAS SMOKEHOUSE & BAKERY FRIDAY PIZZA NIGHTS! VADAS SMOKEHOUSE & BAKERY FRIDAY PIZZA NIGHTS! Vadas Smokehouse & Bakery situated on the beautiful Spier Wine Farm is now serving pizza every Friday night! These sourdough pizza bases are made with stoneground flour and are fermented for 48hrs. Buffalo mozzarella from Buffalo Ridge is used – the only water buffalo dairy in South Africa and the country’s only producer of buffalo mozzarella. All meat products used are from Farmer Angus, raised on Spier Wine Farm. Pair your pizza with a selection of Spier Wines including Spier’s Farm House organic Chenin Blanc, Rosé or Straw Wine. With a shared passion for ethically sourced, quality ingredients Spier and Vadas are a perfectly suited collaboration. Book online at www.vadas.co.za or contact 021 8091137 or info@vadas.co.za directly. empower communities to create positive social and environmental change.